As part of a general diagnostic of a patient to determine if they are in fact asthmatic the doctor will some times need to run tests. It will be part of a comprehensive approach to carefully assess the person’s condition and make sure if they really have the disease. He or she will look at things such as ones medical history, what possible allergies the person may have and any other factors that might have contributed to the symptoms of asthma. This will involve looking at all the factors that might have helped to trigger the asthma symptoms. All of this will be prelude to any possible tests. Because the doctor will truly need to know if the person’s symptoms might relate to other influences such as air pollution or something in the home that is causing an allergic reaction. With the general increase in the problems of asthma that have been reported over the last few years the health care providers are very sensitive and aware that the condition needs to be take seriously. Therefore they are very careful to be sure their analysis of the person’s problem is fully explored before making any recommendations about possible treatments. And that will always be a very thorough process to be sure that nothing is missed or the information is deficient before the prognosis can be ascertained. Thus if the health care provider decides that a test is needed to determine if the person has asthma there are several things that might need to be one. The first thing will be a general physical exam. This will be when the doctor takes time to listen to one’s breathing. He or she will be trying to notice if one is wheezing, has runny nose, sinus infection, reflux disease, psychological stress or sleep problems. And also to be sure of whatever possible allergies the person might have. All of this will enable him or he to get a clear picture of one’s condition and also may even feel a need to test for asthma although a person doesn’t show any symptoms. It will all be necessary before he or she can truly be sure of what the real nature of one’s condition is and how to treat it. The first test a doctor may ask for is a lung function test, which is called, spirometry. This will check to see how the lungs work. It will measure how much air a person inhales and exhales. The machine will give a read out on the results. And the doctor and prescribe medicines to improve the results. Should the starting numbers be lower that normal and even after the medications the results are still below normal the person will be regarded as having asthma. This will also relate to the fact that the person may also have a history of asthma symptoms so this test will confirm the condition. There are some other tests that the doctor might also order. These might include thins such as allergy tests to see which allergens might affect the person, test for how sensitive one’s breathing airways are to outside items like pollution. This is called a bronchoprovocation test. It will test the inhale and exhale capacity when exercising and exposed to cold air. 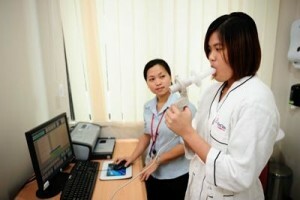 This is will also use the spirometry as for the lung function test. And it will measure how the lungs react to other stimulates when extra active. The doctor may also order a test to see if a person has reflux disease, vocal cord problems or sleep apnea. In addition the person might have a chest xray or an EKG. Both intended to give the doctor a clear picture of one’s condition. 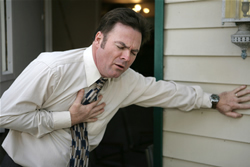 Does Coffee Help to Relieve Asthma Symptoms of Make them Worse? Can an Air Purifier Reduce Asthma Symptoms? Can Asthmatic Mothers Still Breastfeed? Are Vaccines Causing Asthmatic Symptoms in Children? Copyright © 2009 - 2019 Allergies & Asthma Help – A Breath of Fresh Air. All Rights Reserved.